1. Preheat the oven to 180°C, gas mark 4. Individually wrap the beetroot in foil and put on a baking tray. Roast for 45 minutes to 1 hour, until a skewer easily pierces the flesh. When cool enough to handle, rub off the skins and dice. 2. Put the onion in a bowl with the juice of ½ lemon; pour over just enough cold water to cover. Set aside for 10 minutes, then drain. Put the bulgar wheat in a pan with 600ml cold water and bring to the boil; simmer for 7 minutes. Drain and rinse, then tip into a bowl with the herbs and onion. 3. Preheat the grill to high. 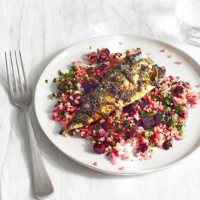 Rub the chermoula over the mackerel fi llets, then place, flesh-side down, on a grill tray. Grill for 4-6 minutes, until the skin is crisp and the fish is cooked through. Toss the diced beetroot through the bulgar wheat, along with the olive oil and remaining lemon juice. Season and serve topped with the mackerel.